The Five Nights at Freddy’s horror games franchise now have a special spin-off entry called "FNAF World" (Android edition), in which players can take the animatronic gang from the original games on a new RPG adventure. You'll be able to download FNAF World Apk free full version for your Android phone or tablet on February 19th (right after the game release). A modded version will also be available on this page as soon as it comes out. 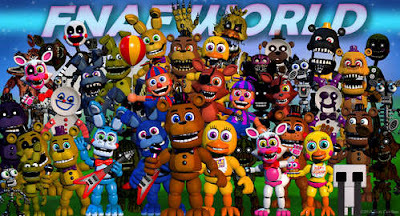 In FNAF World, the player takes the role of scary animatronics and supports them in their fight against mechanical creatures. As in most role playing adventures, you fight using your tactics to stop the enemy expansion. The battles are turn-based, just like in typical Japanese RPGs, and characters (announced 40 heroes) possess unique skills and attacks. Your team can consist of any animatronics from Five Nights at Freddy’s games (they look cute now!). Many of them have alternate forms, which we can activate to change their behavior, strength and skills. UPDATE: Scott Cawthon has removed the game from Steam, and there is no official FNAF World release date for Android yet.. The initial announcement of Feb 19 has been changed and I have no idea when the next one will be. Scott just had a new baby and got his hands full at the time being. I'll keep you updated though! sorry, still no word from the developer except that the game is called "FNAF World Ending"! There is no fnaf world and its MAY!!!! Its the 20 of February. Still nothing? Scott plz were is fnaf world lienk I mad drew all the fnaf charttr and you mad me think I can make my owe games when I groweup and I was going to call it 5 night'S AT OMAR. Scott were's fnaf world you mad me think I can creat my owe game and I was going to call it 5 night's at omar. There is no word from the developer yet, It was announced to be released on the 19th that's why i wrote the article, but unfortunately there is no update yet as to when FNAF World release date will be!! i dont think so but who knows! Maybe there will Not be fnaf World on android? who knows, Scott Cawthon may launch it right now! he doesn't care about deadlines as i've noticed, so who knows?! sorry guys, i have no idea! I thought it's gonna be released on the 19th but I was wrong! He's right just have hope!! Its the 29th of Febuary.. The game was already released! many youtubers play ot already!in ANDROID! I hope he/she gets to finish IT I am so excited! hope he/she gets to finish it! I am going to try and wait..
DX..XD..XP..XO..XV..XM..XB..XL..XD(IKR SO MANY X ..BLABLABLA.. HEHE IKR)..
its not the android version, most apks found online are fakes, dont waste ur time! Do you mean many youtubers play it already on android? You can play fan made version of the game that looks the same (on gamejolt.com) but the real version gonna come at 5th march and stop write some useless crap!! Not to ruin your update but today is the 5th of march and still nothing ive been waiting for this game since january 1st!!! he said it'll be available on the 19th of feb!! but nothing so far! do u want me to make thhe friggin game?! u'll be be the first to play the real FNAF WORLD on Android! lol, dial it down @Anon!! he's just wondering! not yet, lots of rumors going around online but nothing solid yet! im following the developer and will let u know if some news come up! all other fnaf games are on our site! I have one guestion how is IT possible that the games on mobile can be downloaded for free? Is it a HACK or something? Wait if IT is a hack what did i download a other hack? He said the game will be out on PC,ios and android so He will do that but later please dont write "any news?" Because there are no news!! If i gonna found something new i gonna write IT here so dont worry ok? I founded some rumor but First i have a guestion, did somebody check Wikipedia last time? If yes then you allready know they wrote the game is gonna be out at 5 April "SUPRISE!!!!" it seems like the guy just gave up on this game.. It's May now still no game?